Southern California's Best Since 1985 - Award Winning Tri Tip & Ribs! No event is too large for Rosies to cater. At our largest event, we served 3100 people. However, no event is too small either. Everyday, we provide lunches for as few as 20 people. Find out why Rosies is Southern California's BBQ Choice. We cater all types of events; Whether it is your entire company in the parking lot or a backyard family BBQ. No other caterer in Los Angeles can beat our variety, prices, quality, and service. Call our catering staff at 818-451-7131 and leave all the work to us. 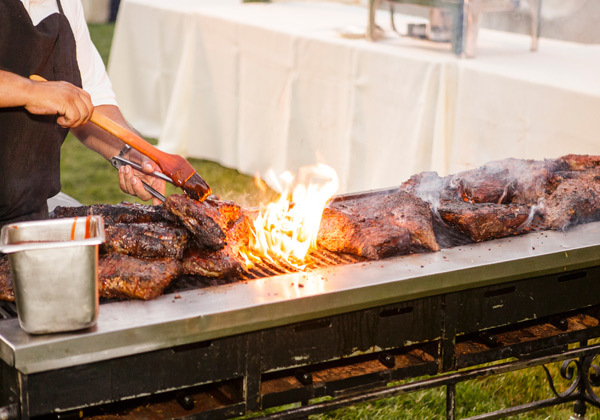 Rosies BBQ Grillery specializes in serving large groups the finest ribs, tri-tip, chicken, hamburgers, and hot dogs at outdoor events in Southern California. Our slow roasted tri-tip, baby back ribs, and chicken are our signature entrees. We offer a number of delicious side items including shredded onions, homemade potato chips, mesquite grilled fresh vegetables, ranch beans, and almost 100 salads made in our kitchen. All our dressings and sauces are made at our restaurants and they are the unique ingredients in many of our salads. 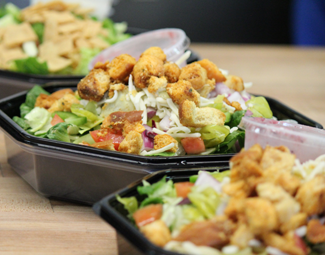 Choose from over 100 delicious salads and sides. 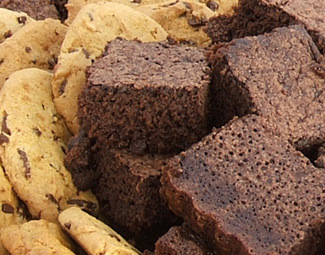 All made from scratch in our Kitchen and guaranteed to make your guests smile. We've been perfecting our slow-roasted Rosies Famous Tri Tip, our wood grilled BBQ Chicken and sweet Baby Back Ribs since 1985. Freshly Baked Chocolate Chip Cookies, Brownies, Fruit Cobbler, Ice Cream Novelties, Paletas, Homemade Ice Cream Sandwiches & More. Since 1985, Rosies has provided millions of delicious meals throughout Southern California. We began as a barbeque restaurant with a fabulous salad bar. From the beginning, all our items were made from scratch. Every recipe we use now has been tried and tested over many years. Our slow roasted tri-tip, baby back ribs, and chicken are our specialty entrees. Our delicious side items include shredded onions, homemade potato chips, mesquite grilled fresh vegetables, ranch beans, and almost 100 salads made in our kitchen. All our dressings and sauces are made at our restaurants and they are the unique ingredient in many of our salads. Over the years, Rosies has expanded to provide off premise catering for breakfast, lunch, or dinner. We have brought the same philosophy to our catering events that have made our restaurants a success; great quality, large portions, fair prices, and exceptional service. No event is too large for Rosies to cater. In 2013, at our largest event, we served 3100 people. However, no event is too small either. Everyday, we provide lunches for as few as 15 People. As you can see, we have expanded our menus to include many different items. Give us the opportunity to help you with your next event and I guarantee our food will be the highlight of your day. 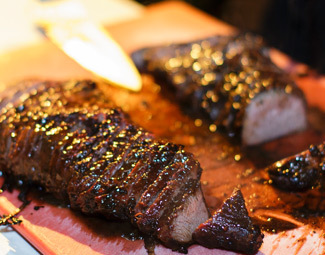 Rosies Ribs and Tri Tip are slowly roasted overnight and smoked with a blend of aromatic fruitwoods, delectably seasoned and charbroiled to perfection while lovingly basted with sauce over a natural wood log burning charbroiler.